During an afternoon last summer, Nicole Schramm-Sapyta rolled out a pie crust while coworkers blended herbs, chopped vegetables and sliced fresh peaches. Staff members from the Duke Institute for Brain Sciences were in the middle of a team-building activity – a farm-to-table cooking class at Southern Season. Teamwork – one of Duke’s guiding principles – involves working collaboratively to solve problems and reach team goals, said Joy Birmingham, senior practitioner with Duke’s Learning and Organization Development. To foster positive work relationships, she recommends team exercises. Here are some ways Duke offices build teamwork. Shortly after joining the Duke Institute for Brain Sciences last year, Schramm-Sapyta wanted to get to know her new team. She asked, “what better way to do it than to surround ourselves with food?” She and a dozen employees whipped up corn pudding, cold soup with shrimp, salad with vinaigrette dressing and a peach tart at Southern Season. “I find that people are more productive when they are comfortable with each other,” Schramm-Sapyta said. Ginny Boyer wanted her newly formed team to bond, so she locked them in a room together. Boyer, director of strategic planning for Duke’s Open Library Environment, booked time at Bull City Escape, where small groups solve puzzles to find their way out of a locked room. Rooms feature varying themes, from stopping a spaceship from self-destructing to finding magical jewels. Duke’s Karsh Office of Undergraduate Financial Support has made a habit of visiting Duke landmarks. The team has visited the Nasher Museum of Art and the Lemur Center. And, most recently, about 10 colleagues climbed 210 feet to the top of the Duke University Chapel. Lisa McClain, information services specialist, says getting out of the office allows everyone’s personality to shine. If you thought downtown holiday window displays in Durham were a little more festive this year, there was a good reason – a competition was going on. 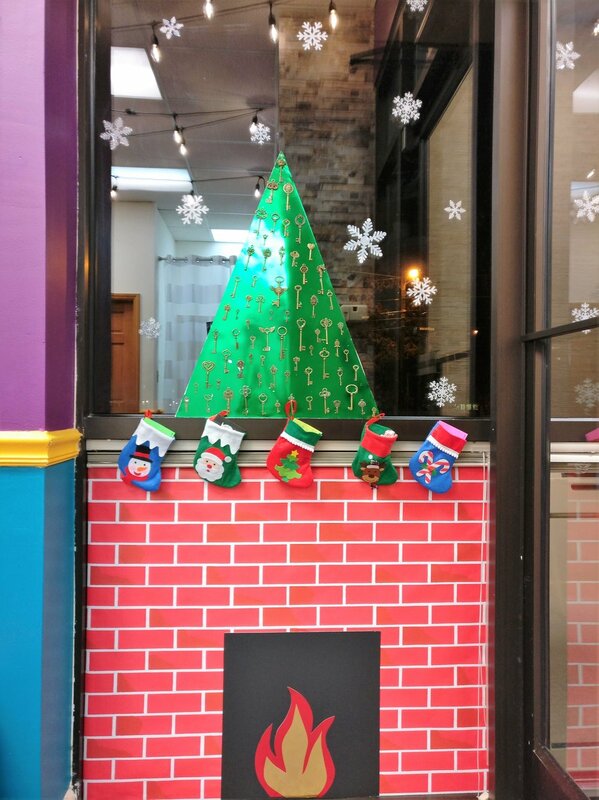 Downtown Durham Inc. (DDI) held a contest for businesses to decorate their front windows, and the winners were announced Tuesday. Bull City Escape's window display. The tree is hung with keys and the stockings are filled with riddles, stickers, and candy. Rock Paper Scissors Salon and Gallery took the top honor, while Empower Dance Studio finished second and Bull City Escape came in third. It’s the first time DDI has held the contest. Rock Paper Scissors, 413 E. Chapel Hill St., decorated its window with Christmas elves flying around, a white tree and gold streamers. One Facebook commenter said the display made her smile. Empower Dance Studio, 109 W. Parrish St., used decals to dress its front windows. There were white and pink Christmas balls and stars along with a pink triangular tree. Bull City Escape, 711 Iredell St., had a cardboard fireplace with stockings hung in its front window. The contest, which had 25 entrants, ran Nov. 25-Jan. 1 with online voting. Rock Paper Scissors Salon got 76 votes, while Empower Dance Studio earned 65 votes and Bull City Escape pulled in 61 votes. DDI offered prizes of $350, $200 and $150 in advertising or marketing services to the winners. Now in its 7th year, the Certificate of Excellence designation recognizes establishments that consistently earn great TripAdvisor reviews from travelers. INDY Week's Best of the Triangle is an "annual reader-guided tour through 353 of the best things—restaurants, bars, people, places, activities, doctors, dentists, lawyers, accountants, yoga studios, hiking trails, bike shops, auto repair shops, florists, basically anything and everything that you could possibly be looking for—in the area. This is, bar none, the most comprehensive guide to the coolest local stuff out there, imitators be damned. And that’s because it pulls from the collective wisdom of tens of thousands of readers casting hundreds of thousands of votes." Bull City Escape was named a Finalist in the "Best Place for Indoor Fun" category - the only escape room to ever be named a Finalist in INDY Week's Best of the Triangle!